Vincent Sélenne, director of Art of Games, a passion for games since 1966. We produce custom made games since 1992. More than 3 millions games up to now. Our speciality is custom made educational games for the NGOs like the Red Cross, Oxfam, Christian Solidarity International. This is our main activity. We also develop business games and business simulations. These are in fact educational games but used for company training. 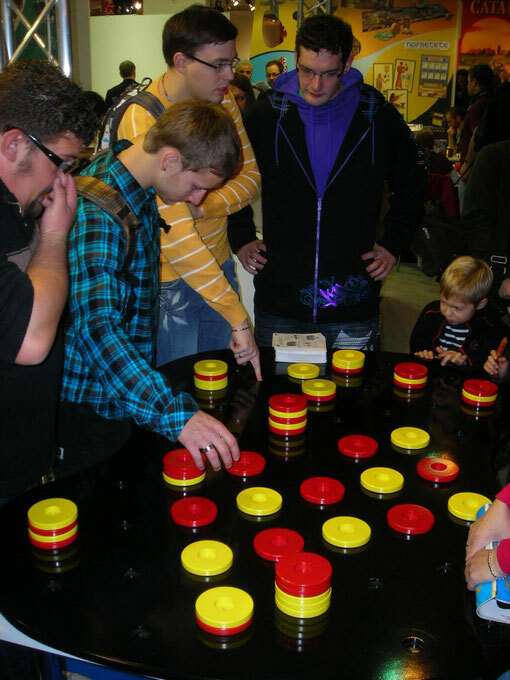 We created and manufactured some efficient promotional games. And finally, we also publish our own games. Don't hesitate to contact us if you have a project. We can create the concept, do the testing, the graphic design, the manufacturing. We manufacture in the EU and in China where we have our own production units. We export to France, Canada, USA, UK, Luxemburg, Australia, New-Zealand and Germany. Check our new game BOXES. 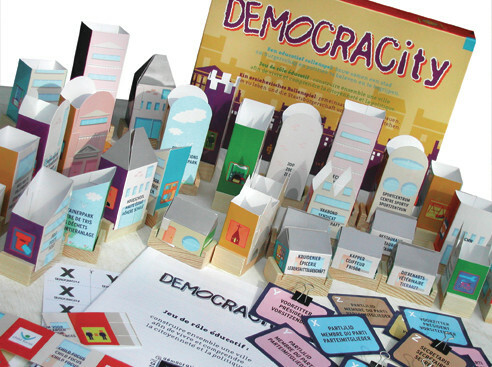 The King Baudouin Foundation developped a giant game for teenagers about democracy. Participants are members of different political parties. They have to build a city and of course there are constraints and choices need to be made. 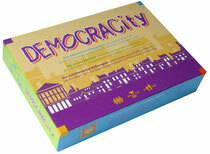 Our challenge was to produce the game in a box format. This is already the third edition. We developped a complex business simulations for the graduating students in management of the KU Leuven, the leading University in Belgium. Up to now more than 2 000 students followed this 6 x 3 hours exercice. We cover the topics of marketing, finance and accounting, company valuation, HRM including change management and creativity management and production planning. a) 600 variables make the simulation realistic. b) each of the 7 fictive companies (3 played by the computer and 4 by the participants) needs to be managed in a different way (positioning, different SWOT,...). c) particpants not only have to take 60 decisions per session but are also expected to write a report about one topic of the simulation where creativity is needed. Do contact us if you are interested. All the material is in English. 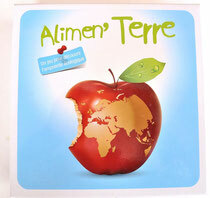 For the non profit organization Empreintes, we manufactured Alimen'Terre. 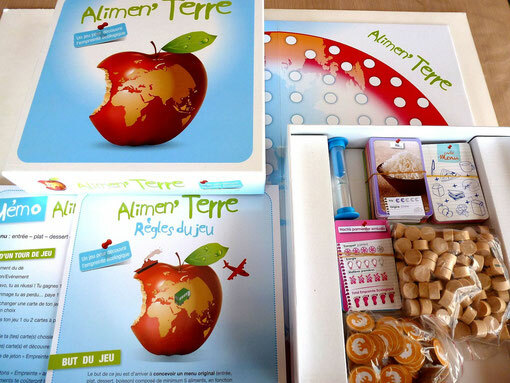 Alimen'Terre is an amazing game about the environmental footprint of our food (type of food, ways of production, conditioning, packaging, transport). Players have to create a specific menu (for example, summer menu to eat oustide) and buy ingredients. It is a cooperative game in the sense that the global environmental footprint is limited for all the players together but there is a sense of competition because participants vote at the end for the best menu. Alimen'Terre: a very good example of a quite difficult topic transposed into a very educational but also very fun game to play. A game we publish ourselves. 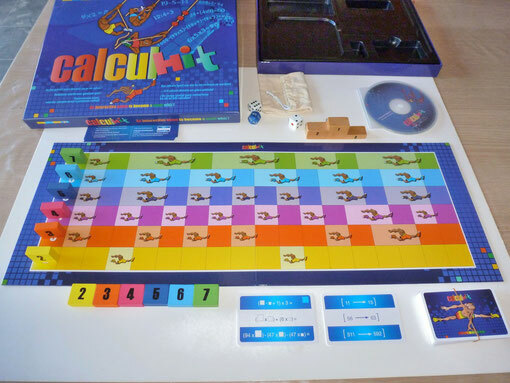 CalculHit is an interactive game to become a math whiz! It is a race to the podium. There are 3 winners to increase the motivation of the kids (one time out of 2, you are on the podium). 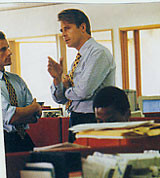 Players play in turn. They have to make a calculation and move forward the pawns who can divide the result. For example, if the result is 10, the player will move pawn 2 and pawn 5. Some cards also let you choose yourself the number. Imagine that you have pawn 3 and that you can choose a number between 20 and 30, then 27 would be an ideal choice because only you will move forward (27 can be divided by 3 and not by 2, 4 , 5 , 6 and 7). There are 3 levels of difficulty. There are two ways of playing: with the board game and with the CD-ROM. 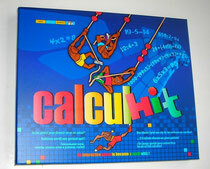 CalculHit was tested on more than 500 children and in 20 different schools. Avalam, beautiful material in wood. Red wins with 7 points - yellow has 6 points. Strategic game for 2 payers. 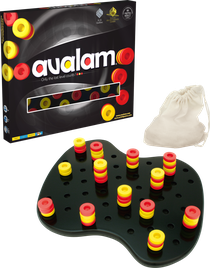 The most awarded Belgian game: Golden Ace in Cannes, Mensa selct USA, 6/6 Québec, game of the year in Belgium and Denmark. The goal is having as many towers as possible of which the top counter is you color. You can play with any counter including the ones of your opponent. The giant version of 160 cm!